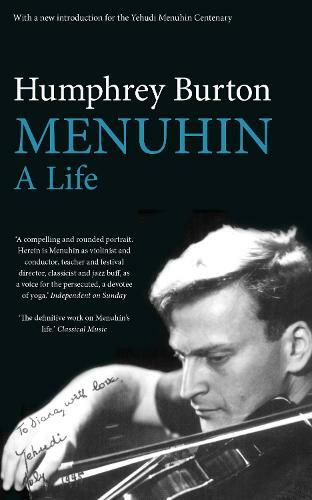 Since 2000, when this biography was first published, Menuhin's name has not faded from public attention, as often happens in the decades after the death of a popular performing artist. Far from it: the centenary of his birth, April 22, 1916, is being marked by celebrations around the world. Yehudi Menuhin was born in New York of Russian Jewish immigrants. Prodigiously gifted, the 'Miracle Boy' gave his first solo recital aged eight and within five years was world-famous. Menuhin was a visionary individualist, who didn't mind shocking the establishment. His post-war support for the conductor Wilhelm Furtwangler, and his determination to build bridges with the defeated German nation, brought him into sharp conflict with the Jewish establishment and DPs in Berlin. Later he spoke out against apartheid in South Africa and denounced the Soviet Union's oppressive policy towards writers and dissidents. Drawing on contemporary sources, unpublished family correspondence and radio interviews, Burton creates a compelling portrait of an extraordinary human being - one of the best-loved classical musicians of the twentieth century.